More than four billion people in the world have had tea at least once in their life. And with five types of tea on the typical tea room shelf, you can spend a lifetime learning about this delicious beverage. No matter what kind of tea flavors you are looking for, there is truly something for every type of person. Many people have a favorite type of tea, while others spend their lives learning about and sampling different types of teas. It is in your best interest to learn about all five different types of teas so that you can be educated as you seek to refine your palette. We want you to use our tea directory to learn about elite growers and tea rooms throughout the globe, and we want you to feel prepared to use this free service! Read on to learn about all the varieties of tea. The five major types of tea are black, green, white, oolong, and herbal — which are not technically teas at all! Each type has a different flavor profile and has varying levels of caffeine. The most popular of each type are found the world over in tea rooms and growers delight in providing their best customers with elegant and limited editions of each type of tea. Much like fine wines, truffles, and precious jewels, there are some teas that are a true delicacy. But all tea comes from the same mother plant: camellia senensis. Knowing your tea types is the first step to finding out what you love. Black tea is classic. When you think of a steaming, warm and comforting “cuppa,” most people are thinking of black tea. With flavors from dry to bitter to soothing, black tea was originally brought to the Western world through ancient spice trading routes. China, Mongolia, Japan, Thailand, India, Turkey, and northern African nations have been drinking tea for thousands of years. Used in the United Kingdom and worldwide for breakfast, Earl Grey, Irish Breakfast, and India’s flavorful Darjeeling are just some of the different types of black tea. In China, Lapsang Souchong is a well-loved smoke-flavored tea with a robust yet delicate taste. Black tea is made up of fully oxidized tea leaves which have been dried and rolled. Sometimes, oils and other flavors are added — like bergamot or citrus peel. Most have a fair amount of caffeine. Green tea is often well-caffeinated and light in flavor, tasting more “watery” than black tea. With well-studied health benefits and the ability to be an awakening elixir, green tea has enjoyed a huge surge in popularity in the past several decades. Like white tea and the rarely exported Chinese yellow tea delicacies, green tea is flash dried early in its curing process in order to prevent oxidation. Matcha is Japanese green tea that’s known for its invigorating properties and earthy flavor. It’s becoming more and more popular in the West, but there’s an ancient Eastern preparation technique that makes the tea experience divine. True tea lovers will use a whisk made of bamboo to make the perfect cup of matcha. Other families of green tea include the multi-faceted sencha and the “jade dew,” or Gyokuro. Hojicha green tea is popular in Japan and is finally traveling to the Western world as a distributor opened in 2018 in Canada. There are nearly one dozen major types of green tea total, and your local tea room can help you sample to find what you like. Bear in mind: Sometimes green tea “dirt” lingers at the bottom of cups. The interesting texture is part of the fun! Even medical professionals recommend green tea and learning the different types. White tea is known as a delicate and regal type of tea, as it’s not oxidized like black tea nor roasted like green tea. Oolong tea is exactly the opposite — it’s prepared as a mixture of black and green tea strategies. White tea — and, to some extent, Chinese yellow tea — are rare and precious, and should be prepared with much care. White tea is fragrant and often absorbs flavors from the environment around it. It contains very little caffeine compared to green and black teas. Oolong tea, on the other hand, has lots of caffeine — comparable to green tea. Oolong’s flavor profile is hearty and known to be bold. Hailing from China, the complex variety encapsulates a more complex makeup than many teas readily available in the United States. Herbal teas are not always technically made of dried tea leaves. Chai tea is one of the most popularly sold “herbal teas,” but the concoction does not always (or even usually) contain tea leaves at all! Chai “tea” is a blend of savory spices, such as cinnamon and cardamom. Moroccan mint, one of the most popular herbal teas in the world, does contain tea. Black tea leaves and dried mint leaves combine to make a caffeinated and refreshing treat, whether hot or cold. Chamomile tea is also a fantastic herbal blend, that has become popular for those seeking a good night’s sleep. Another popular herbal blend is senna tea, known as “Smooth Move” tea. The herbal tea will help you move your bowels — and many report that it also tastes pretty great! Other common herbal teas include turmeric, echinacea, and ginger. 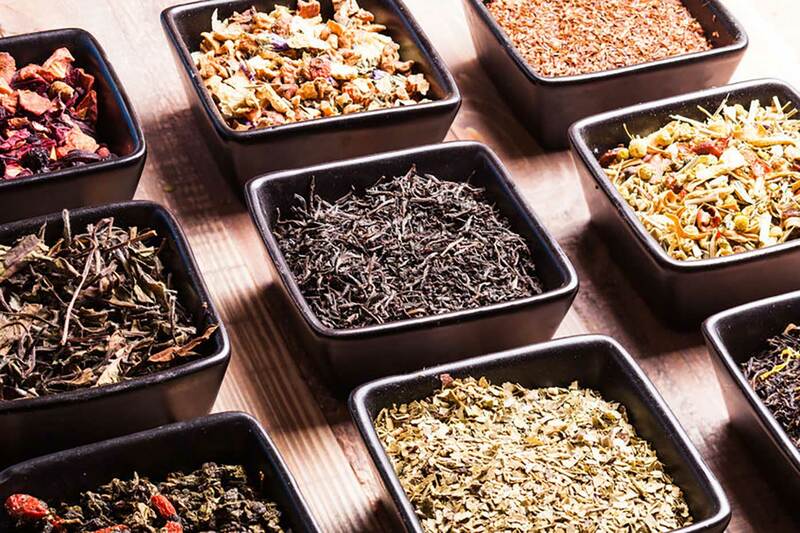 The market for these teas is growing exponentially in the U.S., as more and more varieties enter the market. Our comprehensive articles section can help you learn more about the different types of tea. From black and white to green and oolong, you can go from tea novice to tea expert in no time at all! Our Tea Directory also lists tea rooms, brands, locations, and growers. You can start and continue your tea Education with us. Learn who sells your favorite types of tea and where in the world it comes from!